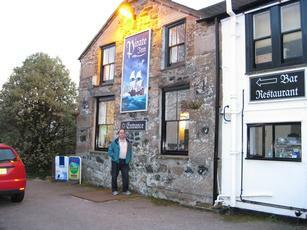 The Pirate Inn was our first stop in Penzance after the nearby Polgoon Cider shop. It's located in the North West outskirts and is a reasonable choice. Having had high hopes of finding real cider in Cornwall, it was the first place I'd visited with any on. Never had an Old Rosie seemed more appealing. It was busy on our early Sunday evening visit with a mixture of drinkers and diners. I'd planned to eat here. But our B & B owner did not recommend it. The idea of tapas did appeal. But we soon found out that they only serve it until 5pm, unless like a couple of locals who walked in after us, you know the owners! Still a nice pub though. Ales were all from Sharp's - Doom Bar, Atlantic & Sea Fury. Now re-opened and under new ownership........and still a pub. The Pirate has been up for sale for some time......now closed. Another visit for their first beer festival on June 26th. It was a good set up with casks in a party tent in the garden. We had 3 of their Cornish beers, Skinners, Wooden Hannd and Keltek and had no problem with any of them. Friendly staff and good food. I suppose Penzance had to have a Pirate pub somewhere and this one is just a short stroll out of the main town. The first thing that strikes you is that it is back to front with the main door at the rear on the opposite side to the main road. I was expecting a strong pirate theme throughout with Jolly Rogers fluttering from fake masts, ceremonial planks and staff with false wooden legs and stuffed parrots on the shoulder. Instead, the carpeted 2 bar interior is quite run of the mill and plainly decorated with some exposed stone walls and a few token maritime pictures. At one end is a small raised dining area and at the other a lobby that leads through to a public bar with pool table. There is a caged bird that I will take as a parrott substitute but don�t expect any Pieces of Eight squarks. Ales included Doom Bar, Abbot and Betty Stoggs, prices and quality fine on my brief visit. Overall it is a cosy enough place and seems quite friendly and civilised but it lacks any real charm or character to make it a worthwhile trip although if you have kids you can let them loose in the decent kid friendly garden.